Just why do whitetail bucks spend so much time and energy growing antlers each spring and summer only to shed them months later during the winter? “Scientists have pondered it for years and we still don’t know,” says noted Iowa whitetail biologist Dr. Mick Hellickson, who points to a couple of solid theories. Some scientists believe bucks shed annually so they’ll have the potential to replace damaged antlers. If a buck had to live his entire life with snapped tines or a broken beam he couldn’t fight his rivals or posture for does. A second theory suggests that bucks shed and grow new racks 10 to even 30 inches larger the following year to keep pace with their increasing weight and girth as they mature to 3½ years of age, 4 ½ and so on. 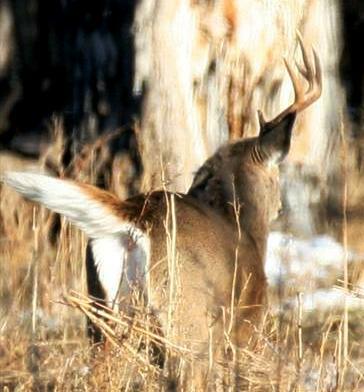 After the rut, bucks’ decreasing testosterone levels cause an “abscission layer” to form between antlers and their pedicles. As the connective tissue dissolves, antlers get loose and fall off. Bucks cast their racks from late December in northern states and into March and April farther south. It varies widely across North America. Weather, snow depth, altitude and especially the availability of nutritious food can influence when bucks lose their antlers from region to region. If your area has an early rut, bucks’ testosterone levels will decrease earlier and some of them might cast their racks two to four weeks earlier than normal. A severe winter may also cause stressed deer to shed earlier than usual. Some people once believed that bucks withdrew to secluded places to shed their antlers away from does and rival bucks, thus avoiding loss of virility in public. Today’s top biologists pooh-pooh that idea, however, saying that bucks are likely unaware of when and where they’ll lose their headgear. Most older-aged bucks shed their antlers earlier than younger bucks. According to biologist Hellickson, the specific time when a buck will shed his antlers may be determined heavily by his individual antler cycle. This cycle is independent of other bucks and is probably centered on each animal’s birth date. A study of captured deer in Mississippi found that individual bucks usually shed their antlers during the same week each year. Other studies show that bucks usually shed both antlers within three days of each other. This entry was posted in BigDeer by admin. Bookmark the permalink. Good stuff Mike! We have had a couple of days of snow so that will make some sheds have to wait till spring to find. Always a fascinating subject! I agree with the shed cause and shed cycle (testosterone, age, same period/yr) as I have them timed through the month of March (Texas) from tons of photos. However, with all of the traffic on all the trails, to and from bedding/food, last year I found not one fresh shed (approx. 200 acres)! So I do tend to believe they do cast in remote areas and feel that until their vulnerability subsides, they stay secluded which is also backed up by lack of photo sighting. A fascinating article. I once asked Dr. Kroll is the reason that older bucks shed earlier than younger ones is because of the weight of the individual antlers being cast. He said, “No, the weight has nothing to do with it.” Logically you’d think it would, but alas…it doesn’t. For years I’ve understood the connection between the timing of individual bucks’ birthrates to their individual physiological growth cycles, etc. It makes all the sense in the world. For example a buck born in early May of one spring, will have a jump on a buck born in late June of the same spring in the same geographical area. This “jumpstart” in life/growth for the one buck will most likely play out (vs. it’s buddy who was born several weeks later) for its entire life. I also believe this at least helps explain why individual bucks enter their “rut” shape earlier, their antler growth begins and ends at seemingly different overall dates than many of their bachelor buddies, the fact that one buck’s fall/winter coat starts maybe a bit earlier, etc. Obviously, it’s not the only variable at play, but definitely has an influence. Love today’s blog, Hanback. I am going out after work today to put out mineral blocks (Indiana’s regular deer season is finally, 100% finished) and trail cameras to try to get some images.